1. i asked about the iso of digital video cameras a while back, and the consensus was that, although difficult and pointless to compute, the figures are high (c. 800, and varying wildly). so whatever the exact figure, video is akin to fast film. 2. i recently lit a night scene for a short i was working on: i set up various background lights, a soft china lantern fill and a lamp pointed at a nearby white wall for key light. then, to bring the light up a little bit (i don't really like shooting wide open, another lingering film instinct), i threw some soft, reflected ambient light up at the ceiling from well behind the camera. the director (who knows nothing of dv and simply wants every scene to look like his eye believes it should) told me i had lit the scene way to bright, pulled my ambient light, and we went ahead and shot the scene. in the end, it actually looked relatively great. so my question: does dv require a completely different lighting approach than film? should i put the big lights away and build kits with fluoros and 200W bulbs? if i'm standing in the middle of a room with a light meter that's reading .02 lumens, but it looks ok in the camera, should i just start rolling? in the end, i'm sick of lighting things as i would for film, then having to disassemble my rig piece by piece to bring the light back to a usable level. throw some links, tips or book title at me, and i'd be glad to do some more research. thanks! Your experience in film lighting is relevant and valuable. You just need to adjust your approach a bit. The meter is not as necessary as it is in film. Instead, a good monitor will be your 'value check'. The operative word here is "good". You really need a professional production monitor, correctly calibrated, to see what is being recorded to tape. If you can trust the monitor, go ahead and light by it. Absolutely, and agreed re: the monitor. Adding the ceiling bounce (what I call "room tone") is fine, I would just put it on a dimmer so that you can evaluate it from the monitor and dial it in to the exact level you like. If you are really fastidious about the color temperature shifting in the fill, you can add scrims or pinch in the doors as well. I personally like working with tungsten in the 200W to 1K range for lighting interiors without daylight, as well as a flo package of 2x4's, 4x2's and my Gyoury lights which are similar to Diva 200's. A Dedo kit is great also. If one needs to balance against daylight, you need at least as much HMI as you are used to using with film and then some, since you need to significantly raise the interior level against the windows compared to film. In this situation I prefer to have at least 2 2500 pars and a few 1200's. A lot of this has to do with one's personal lighting style. I do not find that this approach results in "overlit" images, but I am also careful to cut the light off walls; video eats up lit white walls!. The setup you described had several sources that would contaminate the whole room unless a lot of flagging was used. If I was to key off a white wall in anything but a very large room, I'd have a couple of 4x4 floppies set against the wall to channel the light (and a topper to keep it off the ceiling). In the end; I think I approach lighting for video pretty similarly to how I light film, but I think that has a lot to do with how I light film as well! Cutters are square or rectangular frames with mounting pins attached. Used to control natural or artificial light. 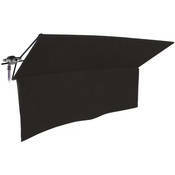 Can be used to protect the camera lens from flares, control spill light from other sources, or keep light from reaching an area on the set."